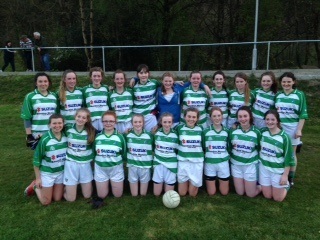 County Minor Quarter Final Result - Valley Rovers 05 -13 St. Marys' (Liscarroll) 02 - 05. Valleys Rovers won this quarter final match played in Brinny on Sunday 4th October, versus St. Mary's, in what ended up being a one sided contest. Leading at half time 02 - 07 to 00 - 04, Valley's made good use of the strong wind that was in their favour during this half. Very good support play by the Valleys team saw them carve out this lead. There was a backlash expected at the start of the 2nd half but Valley's continued where they left off from the first half and finished strongly to win comprehensively. Scores: Daire Kiely 02 - 03, Emer Kiely 01-03 (1 pt free), Kate Bernard 01 - 03, Lisa Lynch 01 - 00, Jennifer Murphy 00 - 01, Grace O'Reilly 00 - 01, Sinead Dart O'Flynn 00 - 01, Ciara Murphy 00 - 01. > Valley Rovers v Castlehaven.